We mostly focus on how to harness the power of solar energy for larger, in-ground pools. But if you’re the owner of an above-ground pool, you know that it’s just as important to keep a comfortable temperature in a smaller pool as well! In this article, we’ll focus on how to choose the best solar heater for above ground pools. If your above ground pool is a permanent fixture in your backyard, this information is for you. You already know that your above ground pool provides just as much enjoyment as an in ground pool. And you may assume that it’s easy to heat, given the smaller volume of water. But you’d be wrong! An above ground pool will lose heat much faster than an in ground pool. This is because the heat can escape through all sides of the pool, as well as the surface of the water. So even though you’re heating a smaller amount of water, you’re losing far more heat. Adding a solar pool cover will certainly help, but you have to prevent heat loss through the sides of the pool as well. Otherwise, your solar pool heater won’t be nearly as effective and you may even feel that it isn’t working properly. First and foremost, before you choose a solar pool heater for your above ground pool, you’ve got to reduce that heat loss! You can do this by adding insulation to the sides of your pool. If you’re going to make the effort to install a solar pool heater, you need to make it worthwhile. There are three options to consider when insulating your above ground pool. A common method for insulating an above ground pool is to wrap the exterior of the pool with some sort of insulating material. This could be a reflective bubble insulation, such as this one.You could also use a covered fiberglass or cellulose insulation, or batting, such as this. However, you should consider a couple of factors that may come into play if you choose to wrap the outside of your pool with insulation. First, there are environmental and health concerns associated with using fiberglass insulation. If you go this route, be sure to handle the insulation with caution and ensure proper installation. And second, wrapping an insulating material around your pool can lead to rust on the walls: the material will trap moisture against the pool wall. And, perhaps not quite as important but still worth noting, it can be hard to get insulation batting to look good! Though it is a bit more labor intensive, you can add insulation to your above ground pool without changing the aesthetic. This is done by inserting the insulation under the pool liner. If you have already filled your pool, this may pose a problem for you – and we have a solution to follow. But, if you are still setting up your above ground pool, consider insulating it underneath the pool liner before filling the pool with water. You’ll need a roll of bubble insulation cut into pieces that fit between each support post. Simply attach the insulation to the pool wall using aluminum tape. You can also add pipe insulation around the support posts for maximum effect. Once the insulation is attached, re-install the pool liner. This option has the potential to be the most effective – but also the most expensive! You can build an enclosure around your pool in whatever style you like and drastically reduce heat loss. This option allows you to leave a space between the insulation and the pool walls, which eliminates the risk of causing rust. You can also choose to include a deck or platform, improving the look of your above ground pool. Of course, you can see where the cost can quickly add up here. But it can be worth it in the long run to have a beautiful enclosure that keeps your pool from losing heat quickly. A pool cover is always a good idea, and a solar pool cover will help reduce heat loss as well. If you are heating your above ground pool, a solar pool cover is a must-have! You can keep debris out of your water, and keep the heat in at the same time. A solar pool cover alone can even raise the temperature of your water on sunny days! When you’re choosing a solar pool heater for your above ground pool, you don’t need to worry so much about the type of heater you are getting. All types of solar pool heaters will circulate the water through a solar collector and heat your pool. What you do need to pay close attention to is the size and efficiency of the solar pool heater. 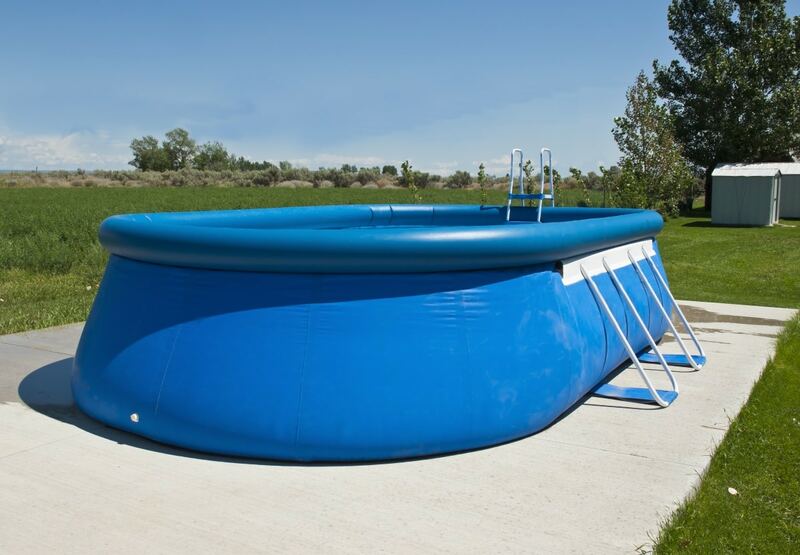 Your above ground pool will require more heating than an in-ground pool of the same size. This is because of the heat loss that we discussed above. To find out how big your solar collectors should be, simply divide the surface area of your pool by two. This will give you the minimum surface area for your solar collectors. If you live in a warm climate with lots of sun, you can probably get away with a solar collector that’s 50% of your pool’s surface area. But, if you live in temperate or cool climates that see a good deal of cloudy days, you’ll want to increase the area of your collectors. Even with insulation, your above ground pool will still lose heat a bit faster than an in-ground pool. To maximize the use of your solar pool heater, you’ll need to look for a system with a high efficiency rating. Solar collectors come with efficiency ratings ranging from 14-20%, with 14% efficiency being on the low-cost end of the spectrum. Most solar collectors sold for residential use will fall around 14-15% efficiency. Now you know how big your solar collectors need to be, and what range of efficiency to look for. It’s time to look at cost and ease of installation. This is where Daniel’s Home of Solar Energy has done the work for you! Head on over to our product recommendations page. You’re sure to find a solar pool heater that fits your needs and your budget.